Black with fine reddish hairs, with the male being slightly smaller in length at 25mm and the female 30mm. The funnel web favours moist, dark situations, with a long silken tube through ground debris (woodchips/mulch) in or on the ground. They are most active during the warmer months of summer and autumn and are considered to be an aggressive spider. 3-5 years and lay a large white egg sac. The male dies soon after mating. Considered very toxic. The male is more toxic than the female. Redback spiders are black and velvety with a red stripe on the drool surface which may be missing in some. Long legs with a large and bulbous abdomen and small Cephalochordata. The male is much smaller and insignificant and is 3-4mm in length. The female is 12-15mm in length. 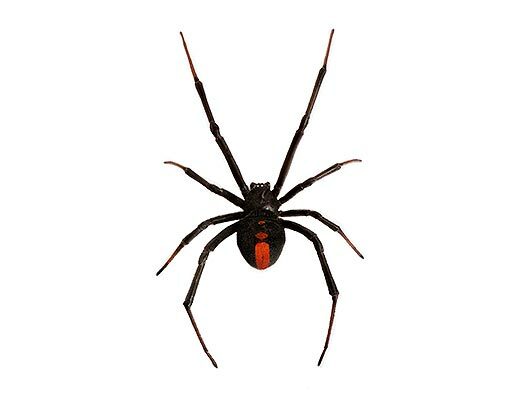 The red back makes a loose web in rubbish, not well sewed toilets and under houses. They are considered to be a non-aggressive spider. Very toxic. The female bite while the male does not. The bite is very painful. Dark brown to black in colour with the legs often black. They have a large abdomen and while the fangs are not obvious they move in a pincer wise motion. The male is 8-10mm and female 15-18mm in length. The black house makes a felted web at the centre of which is a tunnel. They are generally located in sheds, toilets, windows, and under guttering. They are considered to be a non-aggressive spider. Toxic which produces pain, nausea and sweating. Brown to dark brown in colour heavily covered with fine hairs. The female is 25mm-30mm in length with the male being 20mm in length. Short spinnerets, with the terminal segment being the shortest. The male has boxing glove palps with 2 spines on the inner surface of the front legs. The trapdoor inhabits drier situations with usually no lid to cover hole but leaves or litter (woodchips/mulch) may cover it. They are considered to be a non-aggressive spider. Non-toxic with bites usually painful. Enlarged Cephalochordata and the base of the fangs are enlarged. The eyes are on the are on the front of the Cephalochordata. The male has long legs, the palps are only slightly swollen and are 12-18mm in length. The female has shorter legs with black and reddish hairs and is 20-25mm in length. The females live in extensive holes with double doors in the ground. Adult males roam in search of females. They are considered non-aggressive. Toxic with strong fangs and the bite may be painful. Posterior eyes are large and mounted in the square and front of the Cephalochordata. Mottled grey and brown in colour with a union jack appearance on the Cephalochordata. The male has long legs and is 15-20mm in length. The female carries the young on its back and is 20-25mm in length. Habits the garden making holes in the ground covered by litter. They move very rapidly when disturbed are considered non-aggressive. Some may be toxic and the bite mat be painful for a short period. White-tailed Spiders have a dark reddish to grey, cigar-shaped body and dark orange-brown banded legs. The grey dorsal abdomen bears two pairs of faint white spots (less distinct in adults) with a white spot at the tip; the male has a hard, narrow plate or scute on the front of the abdomen. Bites generally cause only mild local effects. The bite is usually felt and is painful, sometimes very painful for a short time, but the pain is not long lasting. A local lump may form at the bite site, but this resolves over hours to a few days. Secondary infection of the bite site is possible but is rare. Ulcers do not develop.